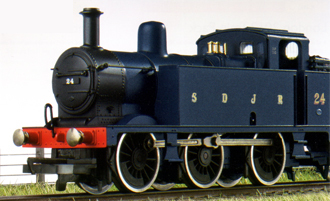 Information: The 3F tank engine; commonly nick-named Jinty’s were actually based on rebuilds of the earlier Johnson 2441 class designed under the auspices of Samuel Johnson. Details: A total of 422 Fowler new build tank engines featured a Belpaire firebox and improved cab and built between 1924 and 1930 under the direction of Henry Fowler. Locomotive construction took place at various works through-out the country; including Horwich Works and the private firms of Bagnall’s, Beardmores, Hunslet, North British and the Vulcan Foundry. Six locomotives were allocated to the Somerset and Dorset Joint Railway. Eight were sent to France to full-fill Ministry of Defense service during World War 2. Five were later repatriated with the LMS. Although primarily designated as goods engines they were in-fact employed in many mixed traffic movements including branch-line passenger service and assisting express passenger services as banking engines on the Lickey Incline. In service the livery was traditionally unlined black. Over the years a variety of lettering and logo emblems were applied to the side tanks. 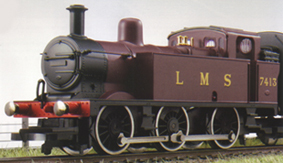 In preservation the Jinty’s have seen a wide variety of fictional liveries including LMS maroon and Thomas the Tank Engine blue. Five further units were withdrawn prior to amalgamation with British Railways. Further withdrawals commenced in 1959 with half of the class being withdrawn by 1964. The final five survived in service until 1967. One remaining locomotive; 47445 continued in service with the National Coal Board into the early seventies. A total of ten locomotives have survived into preservation, including 47445. Of these several are used as parts donors and unlikely to ever see active use again. At least four are currently operational with several others including the afore-mentioned 47445 being over-hauled or having plans for the future.